The Office of Resilience and Coastal Protection, like its counterparts in other states, was developed under the purview of the federal Coastal Zone Management Act. The program gained NOAA approval in 1981 following the passage of the Florida Coastal Management Act. The coastal program operates through the Florida Coastal Office within the state Department of Environmental Protection (DEP), which provides oversight over coastal management grants, the Coastal and Estuarine Land Conservation Program, and federal consistency reviews, among other activities. Based on the geography of Florida and the legal basis for the state program, the entirety of the state is defined as the coastal zone and falls within the authority of the state coastal management program. As is the case with other state coastal management programs, the Office of Resilience and Coastal Protection conducts federal consistency reviews to ensure that federal actions that may affect the coastal zone are consistent with identified state enforceable policies. The intent behind this review process is to improve decision-making related to use of natural resources, vulnerability to coastal hazards, and state growth patterns, all of which have a potential nexus to coastal flood risk. Types of federal actions under review include federal agency activities, federal permitting or licensing activities, Outer Continental Shelf Activities, and federal assistance to state or local governments. Federal agency activities under the purview of federal consistency include proposals that physically alter coastal resources, plans that direct future agency actions, rulemaking that affects coastal zone use, and Outer-Continental Shelf leasing. Permitting consistency reviews are conducted as state permits such as Environmental Resource Permits or Joint Coastal Permits are processed. In addition to federal consistency responsibilities, the Office of Resilience and Coastal Protection also oversees four types of areas of special management. Areas of Critical State Concern, recommended by the Florida Department of Economic Opportunity, are areas that would put natural resources at risk if uncontrolled development were to occur. Aquatic Preserves set aside certain state-owned submerged lands and associated coastal waters in areas that have exceptional biological, aesthetic, and scientific value, overseen by the Florida Coastal Office. The state’s water management districts implement Surface Water Improvement and Management areas, primarily focused on addressing water quality issues in critical water bodies. Beach and Inlet Management areas also exist where coastal erosion threatens natural resources. Other Office of Resilience and Coastal Protection activities include land acquisition, a subgrant program, and outreach activities. Land acquisition by the management program is conducted through the NOAA Coastal and Estuarine Land Conservation Program, which is implemented and managed within the state through the Florida Forever Program. Land acquisition activities focus on fragile coastal upland and wetland resources including undeveloped and buffer areas. Subgrant programs include Coastal Partnership Initiative grants that provide funds to localities to support projects designed to improve community resilience, coastal resources stewardship, and access to coastal resources. The program has a number of outreach initiatives such as the Florida Assessment of Coastal Trends, a collection of indicators used to inform planning decisions, and the Performance Measurement System, a NOAA program designed to quantify the effectiveness of coastal zone management activities. The Coastal Construction Control Line Program (CCCL), which is one of three components of the state’s Beach and Shore Preservation Act, protects Florida’s sandy beaches and dunes from imprudent construction jeopardizing the beach/dune ecosystem. This program establishes an area of jurisdiction seaward of designated control lines in coastal areas in which specific siting and design criteria are enforced for construction activities. Construction standards seaward of the control line are typically more stringent in order to prevent beach and dune system destabilization and protect natural resource values including upland property protection during flood or storm events. The program is administered through a permit system, with CCCL permits issued based on the potential construction impacts to coastal environments, adjacent properties, and wildlife, including specific requirements for shoreline armoring activities. Rules and requirements related to the CCCL are found in chapter 62B of the Florida Administrative Code. General prohibitions based on program standards include coastal construction without necessary permits, coastal construction projects that will result in adverse impacts with consideration of proposed mitigation plans, and construction projects that will interfere with public use of areas seaward of the high-water line, except when deemed necessary. Approval or denial of a permit application is based upon a review of the facts and circumstances on the potential impacts on the beach dune/system, adjacent properties, native salt-resistant vegetation and marine turtles, and interference with public beach access. Given this department policy, CCCL permits are approved only when a construction project is shown to have a net positive benefit on surrounding coastal systems. Criteria for permit approval include a number of measures with a nexus to coastal flood risk. The use of green or flexible coastal infrastructure is required where practicable. Structures that may alter coastal sediment movement are prohibited unless a net benefit to coastal systems is demonstrated or mitigation of adverse coastal impacts is provided. Permits for coastal armoring are also restricted except as a last resort for certain eligible structures, and armoring is only permitted after consideration of alternatives such as dune enhancement, beach restoration, and structure relocation. Sea level rise must also be considered during the review of coastal armoring applications. Any existing structures that have caused adverse impacts due to interference with coastal sediments must be redesigned or relocated during any reconstruction projects, and such structures may also be ordered removed if threats exist to human life, health, or welfare. Coastal construction projects determined to have an adverse impact must employ a program to monitor any impacts to coastal systems, and any unavoidable adverse impacts must be offset through a mitigation plan. Development in floodplain areas in Florida is managed at the local level using the standards of the National Flood Insurance Program. Community responsibilities in Florida involve recognition of flood hazards during community planning, adoption and enforcement of flood maps and flood damage prevention ordinances, and establishment of elevation standards for new and substantially improved residential and non-residential structures. Specific floodplain management practices and standards that go beyond federal and state requirements vary by locality. The State Floodplain Management Program in Florida, housed within the State Division of Emergency Management’s Bureau of Mitigation, operates as the State Coordinating Agency for the NFIP, working collaboratively with counties and municipalities in Florida to help administer local floodplain management regulations. Beyond its coordinating responsibilities, the State Floodplain Management Program recently undertook a pilot program, CRS-CAV, to encourage enrollment in FEMA’s Community Rating System, which provides flood insurance premium discounts based on community implementation of additional or improved floodplain management practices. The pilot program includes seven performance measures: adoption of floodplain regulations aligned with state building codes, annual inspection of flood hazard areas and resolution of non-compliance, adoption of flood zone permit application forms, procedures, and checklists, use of FEMA’s Elevation Certificate Form with verification of accuracy, outreach to propane and air conditioning companies regarding compliant installations, development of substantial improvement or damage determination procedures, and online access to digitized flood insurance rate maps and elevation certificates. Statewide floodplain management rules and regulations are largely consistent with NFIP standards. Floodway development is only permitted if a proposed project will not increase flood levels or adversely impact structures on other properties, demonstrated through a “No Rise” certification. Wave action is considered beyond coastal V zones in areas where revised FIRMs are able to delineate the extent of wave action between 1.5 and 3.0 feet, known as the coastal A zone or CAZ. CAZs are rated lower than V zones, but construction requirements in Florida are equivalent to V zones. A number of areas in Florida also exist within the federal Coastal Barrier Resource System, where NFIP insurance is unavailable for new or substantially improved structures. Coastal floodplains also intersect with areas subject to the Florida CCCL program. Where these areas overlap, the more restrictive code requirements and development standards apply. In addition to statewide standards, local permits are necessary for any land-disturbing activities in flood zones including new construction, additions, substantial improvements, renovations, and substantial repairs. Mobile home placement, placement of temporary buildings, agricultural construction, transportation construction, use of fill, alteration of stream hydrology, and land subdivision also require local approval. Levee accreditation, elevation certificate requirements, restrictions on use of fill, and general elevation construction practices in flood hazard areas in Florida also remain consistent with standard NFIP practices. Wetlands in Florida are managed through the state Environmental Resource Permit (ERP) program, part of the Department of Environmental Protection’s Submerged Lands and Environmental Resources Coordination initiative. The ERP program is implemented by the DEP and state Water Management Districts. While responsibilities can also be delegated to localities, this is currently not a widespread practice. Environmental Resource Permits regulate virtually all alterations to the natural landscape that exceed permitting thresholds, covering multiple topics such as wetland impacts, erosion, and stormwater with consideration of upland area impacts. The ERP program is operated in addition to any federal program that also regulates use of U.S. waters, allowing for joint permit applications with agencies such as the USACE. If activities occur within submerged lands owned by the state, a Sovereign Submerged Lands (SSL) permit is also required. SSL permits are granted through consent by rule, letter of consent, easement, or lease, and must be issued concurrently with a required ERP. Wetlands are delineated using a specific state methodology as opposed to the federal method, although the two produce generally similar results in practice. Delineations occur on a parcel by parcel basis following a request or as part of a permit application review. A number of ERP criteria for evaluation form the basis of wetland management in Florida. Criteria apply to construction, alteration, operation, maintenance, abandonment, or removal of projects unless exempted by statute or rule, including dredging and filling, and are based on the programmatic goal of maintaining wetland ecological functions rather than acreage. Maintenance of water quality standards within wetlands is a key aspect of ERP criteria, as doing so preserves a number of wetland functions including flood storage. Several environmental conditions for issuance must be met in order to obtain a permit. Activities may not adversely impact the value of functions provided by wetlands to fish, wildlife, and other listed species. Applicants must also provide assurances that activities are not contrary to the public interest, weighing factors including changes in flood risk, and that activities will not not adversely affect the quality of receiving waters including wetlands, with additional standards for shellfish harvesting areas. Additional permit standards require that activities will not have secondary impacts to water resources or unacceptable cumulative impacts upon wetlands, the latter of which may be offset by mitigation activities. Mitigation efforts, also based on wetland function rather than acreage, can only be employed after all practicable actions to reduce or eliminate adverse impacts of a project have been used. If deemed necessary, mitigation efforts must offset any adverse impacts to wetlands functions, determined through a state Uniform Mitigation Assessment Method, and projects may be denied permits if mitigation actions are unable to sufficiently offset these adverse impacts. A number of approaches can be used to mitigate adverse impacts, including restoration, enhancement, creation, or preservation of wetlands, adjacent surface waters, or upland areas that function as hydrologic contributing areas. As a best practice, mitigation efforts that create, restore, enhance, or preserve similar ecological communities to those impacted are encouraged, using historically present ecological conditions as a reference where possible. Mitigation activities that occur on-site are generally preferred, but mitigation may also be employed off-site or through purchase of credits from a mitigation bank as long as sufficient adverse impacts are offset. The Florida Building Code shares many of the same fundamentals of flood resistant construction as the construction requirements of the NFIP. Building foundations must be capable of resisting flood loads, and walls and roofs must be structurally sound so as to minimize penetration by wind, rain, and debris. Lowest floors must be elevated to the level of the design flood event to prevent intrusion of floodwaters. Use of any enclosure below elevated floors is limited to parking, storage, and building access, and any such space must be constructed using flood damage resistant materials. All equipment and utilities must also be elevated or designed to withstand flood loads or otherwise be designed to be restored quickly. Several provisions of the Florida Building Code, which refers to the standards in ASCE 24: Flood Resistant Design and Construction, exceed the construction requirements of the NFIP, and communities may also enact higher standards than state requirements. The most recent Florida Building Code contains several major updates to flood resistant construction requirements. One foot of freeboard above BFE is now required for dwellings in all flood zones. In addition to the foot of freeboard, critical facilities must be elevated or protected to a height of BFE plus two feet or the 500-year flood elevation. If an area is zoned as a coastal A zone, it is regulated in the same way as a V zone, with stemwalls permitted. Local scour and erosion hazards must also be considered in the design and construction of foundations in coastal A and V zones. Flood openings are required in all walls and breakaway walls, and an exterior door is required at the opening of any stairways enclosed by breakaway walls. Restrictions on dry floodproofing of mixed use buildings have also been updated according to ASCE commentary. The updated code also includes a modified section addressing Florida’s CCCL programs requirements, which are now more closely aligned with coastal V zone requirements in an effort to minimize case-by-case determinations of which set of regulations apply as the more restrictive. Regional Planning Councils conduct planning at the regional level in Florida. Communities must also develop comprehensive plans to account for future economic, social, physical, environmental, and fiscal development. Comprehensive plans must contain a number of elements including future land-use, transportation, water quality, aquifer recharge, conservation of natural resources, open space, housing, intergovernmental coordination, and coastal management for designated coastal communities. To address concerns over sea level rise, coastal communities can also designate low lying coastal zones that experience frequent coastal flooding as adaptation action areas. The coastal management element of a comprehensive plan must be designed to meet a number of objectives such as the maintenance and enhancement of the coastal zone environment, balance of utilization and preservation of coastal resources, limit of public expenditures that subsidize development in high-hazard areas, and protection from the effects of natural disasters. State statutes establish a number of components required of coastal management planning elements to meet these objectives, including several with a nexus to coastal flood risk. Future land use plans must be evaluated in terms of environmental and socioeconomic impacts to coastal resources, and plans must be developed to mitigate adverse impacts. Principles for natural disaster hazard mitigation must also be developed, as well as principles for protection of existing beach and dune systems. Development and redevelopment principles of coastal management plans must also contain solutions that reduce flood risk, whether it be from high-tide events, storm surge, flash floods, stormwater runoff, or sea level rise. Stormwater management practices, implemented through the state DEP and WMDs, are also under the purview of Florida’s comprehensive Environmental Resource Permit program. As with other types of activities affecting Florida’s landscapes and surface waters, the construction, alteration, operation, maintenance, abandonment, or removal of a stormwater management system must meet permitting criteria if permitting thresholds are exceeded, unless specifically exempted. Due to the comprehensive nature of the ERP program, stormwater management systems are evaluated in terms of adverse effects to both surface water quality and quantity, and as a general rule activities must not be harmful to water resources or inconsistent with overall objectives of the DEP or relevant Water Management District. Water quantity performance standards for ERPs are designed to prevent adverse impacts due to changes in peak stormwater discharge rate, volume, and pollutant loading. To receive a permit, applicants must provide information to ensure that activities will not cause adverse flooding of any kind. Projects must not alter floodways, floodplains, levels of flood flows, or velocities of adjacent streams in a way that adversely impacts the off-site flood storage and conveyance capabilities of a water resource. Activities must also avoid any adverse impacts due to low flow conditions or disruption of base flow levels. Specific design and performance standards relevant to stormwater quantity are developed and published by each Water Management District. In terms of water quality, activities must comply with Florida’s state water quality standards and obtain permits through the National Pollutant Discharge Elimination System where relevant. Erosion management and sediment control are also components of Florida’s Environmental Resource Permit program. Applicants must provide a plan for minimizing erosion and controlling sediment discharge as part of an ERP application. Plans are site specific, and must take into account the location, installation, and maintenance of best management practices at construction sites. Larger project permits also require development and implementation of a Stormwater Pollution Prevention Plan as part of Florida’s National Pollutant Discharge Elimination System Stormwater Construction Generic Permit. Though these permit programs are generally focused on preventing stormwater pollution during construction, permit criteria also have a nexus to flood impacts. As a rule best management practices must be used to retain sediment on-site during construction, and practices must also assure that any sediment discharges do not cause or contribute to a violation of state water quality standards. Additional erosion control efforts are required if a project may lead to adverse impacts to wetlands or cause off-site flooding. The state CCCL program additionally addresses erosion of coastal sediment through coastal construction requirements. Principles to be considered as part of an erosion and sediment control plan include consideration of landscape topography and drainage patterns, maintenance of low runoff velocities, and stabilization of areas after final grade has been obtained. It is recommended that erosion control activities consist of both vegetative and structural measures along with other management techniques to minimize movement of sediment. A number of local and regional climate adaptation initiatives have also been developed in coastal areas throughout Florida. One major regional initiative is the Southeast Florida Regional Climate Compact, a collaborative effort among four counties in southeast Florida to coordinate mitigation and adaptation activities. The compact works to respond to state legislation related to climate adaptation and publishes planning guidance documents for use in coastal communities. One such guidance document is the Southeast Florida Regional Climate Action Plan, which outlines a framework for addressing impacts due to a changing climate, including actionable recommendations in areas such as sustainable community planning, water supply and infrastructure, natural systems, agriculture, energy, risk and emergency management, and public policy. The compact has also produced an implementation guide to accompany the climate action plan and has published regional unified sea level rise projections for planning purposes. The entirety of the state of Florida falls under the formal definition of the coastal zone, providing the state coastal management program with the authority necessary to fully address coastal issues even if such issues stem from inland areas. The federal consistency review process gives the Office of Resilience and Coastal Protection influence over federal actions in the coastal zone. 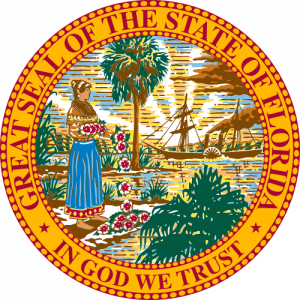 The Florida program has a broad range of enforceable policies that federal actions must be consistent with, increasing the scope of the consistency review process. The state coastal management program’s Coastal Partner Initiative grants bolster flood risk management capacity throughout the state by funding projects to improve coastal community resilience. Wetland delineation for wetland management purposes is performed using a specific state methodology that differs from the federal method. The methods produce similar results, but the presence of a state method provides a precedent for changes in delineation methodology depending on state priorities. State Water Management Districts publish specific design and performance standards related to stormwater quantity, improving sate capability to address regional stormwater issues. The Office of Resilience and Coastal Protection conducts land acquisitions through the Florida Forever Program and NOAA Coastal and Estuarine Land Conservation Program, with acquisitions focusing on undeveloped and buffer areas within coastal uplands and wetlands. The Coastal Construction Control Line Program establishes specific siting and design requirements for designated coastal areas. Permit approval for the program requires the use of green coastal infrastructure where practicable, and coastal armoring is only permitted after alternative measures have been evaluated. Wetland mitigation within Florida is based on ecological function as opposed to acreage, with impacts determined through a state Uniform Mitigation Assessment. Mitigation efforts that create, restore, enhance, or preserve wetland functions are encouraged. Erosion management guidance recommends the use of vegetative measures in coastal areas to minimize movement of sediment. Sea-level rise must be considered during review of coastal armoring applications as part of Coastal Construction Control Line permit approval. Coastal Construction Control Line design requirements for coastal armoring projects include levels of protection for different structure types based on coastal storm return intervals, extending to 50-year return interval storms for public safety facilities, evacuation routes, and historic sites. Dwellings in all flood zones must be elevated one foot above the base flood elevation, and critical facilities must be elevated to two feet above the base flood elevation or to the 500-year flood elevation. Low lying areas in the coastal zone that experience frequent flooding can be designated as adaptation action areas. The purpose of these areas as stated in the state administrative code is to address future issues related to sea level rise. The development and redevelopment principles within the coastal management element of a community’s comprehensive plan must address future flood risk from sources such as high-tide events and sea-level rise. Florida’s Energy and Climate Action Plan was formed following a 2007 executive order and contains a planning framework with specific goals related to flood protection as well as strategies for implementation. The state Community Resilience Initiative assists coastal communities with the development of planning strategies for future flood risk due to sea-level rise, leveraging resources from the Florida Department of Economic Opportunity, Department of Environmental Protections, and Division of Emergency Management. Regional climate adaptation initiatives such as the Southeast Florida Regional Climate Compact coordinate mitigation and adaptation activities. The compact has published a climate action plan, an implementation guide, and regional sea-level rise projections for planning purposes. As part of the Coastal Construction Control Line Program, any unavoidable adverse impacts of coastal construction projects must be offset through a mitigation plan, including a program to monitor impacts to coastal systems. The CRS-CAV program, a pilot program under the State Floodplain Management Program, seeks to increase enrollment in FEMA’s Community Rating System, with a number of performance measures designed to increase the effectiveness of mitigation practices. Areas rated as coastal A zones on FEMA flood maps have the same construction requirements as V zones within Florida, providing a higher level of protection for at-risk coastal areas. The coastal management element of a community’s comprehensive plan must address the limitation of public expenditures that subsidize development in high-hazard areas, acknowledging the benefits of responsible investment in coastal areas. The Office of Resilience and Coastal Protection’s enforceable policies used for federal consistency review encompass the use of natural resources, vulnerability to coastal hazards, and state growth patterns, addressing coastal issues from multiple perspectives. Areas of special management within the Office of Resilience and Coastal Protection are determined in part by risk to natural resources due to uncontrolled development or rapid urbanization, with input provided from the Florida Department of Economic Opportunity. The Coastal Construction Control Line Program is based on the state Department of Environmental Protection policy of regulating coastal construction to prevent degradation and promote restoration of coastal ecosystems, formally addressing the connection between development and ecological function. Program permits are also evaluated on the more broad concept of net benefits to coastal systems as opposed to more narrow performance measures. The comprehensive nature of Florida’s Environmental Resource Permit program as well as the programs focus on ecological functions encourages applicants to consider potential project impacts from multiple perspectives, such as preserving water quality within wetlands to maintain flood storage functionality. Under the Environmental Resource Permit program, stormwater management systems are evaluated in terms of both water quality and quantity, with performance standards that extend beyond pollutant loading to ensure that activities do not lead to adverse impacts on stormwater discharge rate or volume. Comprehensive plans for communities must contain an element related to intergovernmental coordination, and designated coastal communities must also develop a coastal management element, encouraging management of coastal issues across multiple government entities during the planning process. Climate adaptation measures are dispersed throughout several state programs addressing coastal issues such as the Coastal Construction Control Line, adaptation action areas, and coastal management element of comprehensive planning, building adaptation capacity into existing programs without reliance on new initiatives.